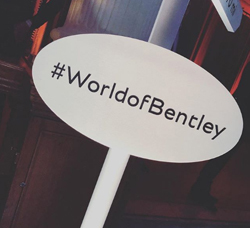 As ever, Signature Car Hire was delighted to be invited to a Bentley launch party, and what a party it was! Who could not be impressed with this stunning drop top coupe from the popular British Marque. 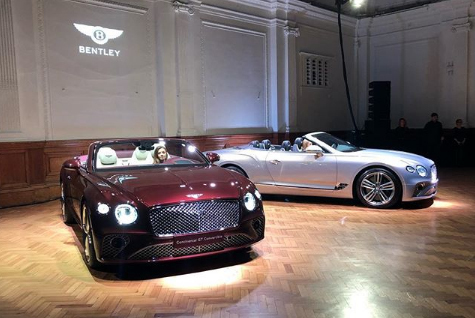 The stunning new Bentley Continental GT Convertible has a lot to offer. For starters there is the custom made convertible roof that can be put up or stowed in a jaw dropping 19 seconds, with the car travelling up to 30 mph (50 km/h). This transforms the Continental GT Convertible from a opulent coupe into an open-top Grand Tourer in just a moment. Bentley fans can also look forward to comfort features including a brand new neck warmer which has been designed to be both warmer and quieter than the previous version. It is effortlessly integrated into the heated Comfort Seats, which increases efficiency and airflow around the headrests which are electrically adjustable. As you would expect from Bentley, the styling of this masterpiece is not overlooked and the new neck warmer showcases a chrome centre vane that runs the full width of the duct, mirroring Bentley’s famous ‘bullseye’ vents. Combined alongside a heated steering wheel, seat heaters and new heated armrests, these refined comfort features deliver effortlessly a luxurious driving experience.